After last year's seed starting fiasco, I considered not starting my own seeds again this year. Buying plants at the store is so inexpensive, you don't have to worry about your cats eating them, and you don't have to spend the time taking care of them. But, my super great husband got me this four foot grow light for my birthday last year, and so I plant again! Planting seeds is really only worth it, in my opinion, if there are varieties of plants that you want that can't be found at the store. Yesterday I only started some heirloom tomatoes and peppers, and some random seeds I had left over from last year. I put off planting these for close to a week because I didn't have plant markers and didn't want to spend money on buying some (I know, I get hung up on little things when it comes to getting things done!). Many of the DIY plant markers require rocks, wood, popsicle sticks, or clay, none of which I had on hand. So I roughly followed a tutorial on how to make them out of a plastic bottle. 1. Get your container. 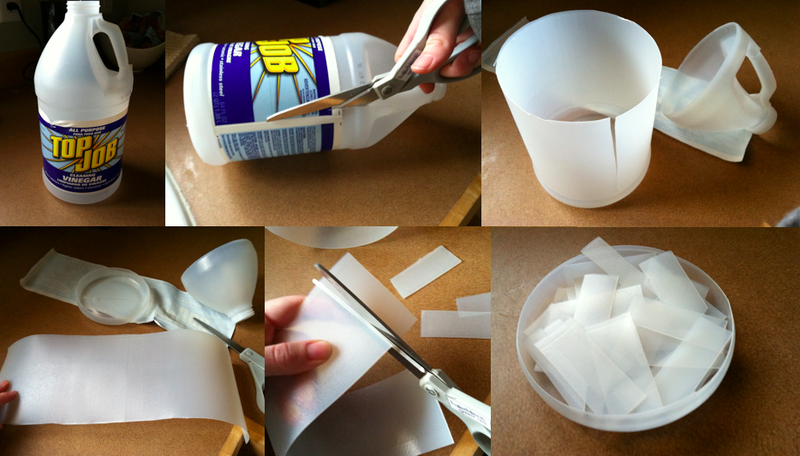 I used a vinegar bottle, but you can use a milk jug or any plastic container you can cut through. 2. Cut down the center of your bottle. You may have to use a craft knife to get it started. 3. Cut off the top. 4. Cut off the bottom. You will now have a sheet of plastic. This is the time to wash the plastic well. 5. Cut the strip into 3/4" or so strips. 6. Plant markers! You can cut the bottom to a point but I found it unnecessary. Just write on them with a permanent marker and you're good to go! The tutorial I saw this on said they would hold up to watering, but I have yet to find out.